An old tired-looking dog wanders into my yard. I examine the dog's collar and feel his well-fed belly and know the dog has a home. The dog follows me into the house, goes down the hall, jumps on the couch, gets comfortable and falls asleep. Thinking this is rather odd, I let him sleep. After about an hour the dog wakes up, walks to the door and I let him out. The old dog wags his tale and leaves. The next day, the dog comes back and scratches at the door. Again, I open the door, and the dog comes in, goes down the hall, jumps on the couch, gets comfortable and falls asleep again. Again, I let him sleep. After about an hour the dog wakes up, walks to the door and I let him out. The dog wags his tale and leaves. This goes on for days. By now, I am really really getting curious, and I pin a note on the dog's collar: "Your dog has been taking a nap at my house every day." We have two very ferocious dogs, one is in the Avatar, this is the other one. Each night, we fill up the bird feeder hanging from the patio roof,it is empty by mid-afternoon. Sunflower seeds seem to be the favorite, mixed with other grains. the table gets 3 scoops of the feed mixture, and now at 11 PM, you can see what is left. We get Cardinals, Bluejays, Finches, Sizzortails, and more that I don't know the names for. usually there are 7-10 squirrels in the mix having all kinds of fun jumping from that table to the bird feeder, it "must be better", right? 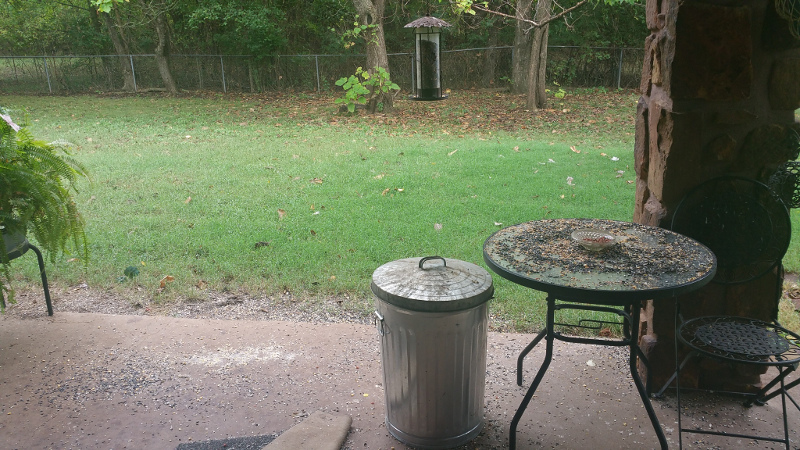 My recliner faces the patio doors, the whole of that is my view during the day.... when the dogs are let out, ( wish they would learn to use that expensive doggie door ) the squirrels disappear in a rush, while the dog barks and jump up at them. We hung a big long dead limb from the closest tree to the porch to the far tree in the back near the fence. the squirrels run to the near tree, then across "the bridge" maybe 5 feet off the ground, while Missy is jumping and barking... lots of fun for us, and them. we go through about 20+ lbs per months of seed in the summer, about twice that in the winter months. peaked out and see that today's rashion of Bird & Squirrel menu has been refilled.